← “Roadside Hazards” (AKA trees) to be removed across Victoria in a VicRoads’ war on the environment. Beautiful tree-lined road at Cathcart (near the Grampians) in VicRoads’ firing line. 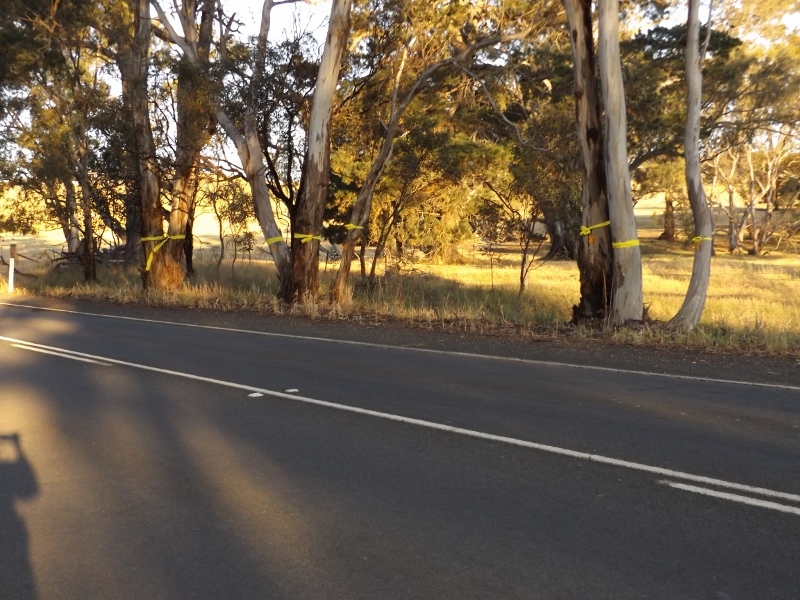 35 – perhaps more – beautiful Redgums and Yellow Box trees at Cathcart on the Ararat- Hall’s Gap Rd are set to be cut out. The choice of trees to be destroyed seems random and illogical, and quite unnecessary. VicRoads already knows how to have Armco railing really close to trees- just close up the post spacing like this to reduce deflection in the case of an impact. Locals seriously question the need to remove this tree. It’s much further from the bitumen, and the drain is far more dangerous. Trees to be removed have been marked with yellow ribbon by persons unknown so passers by can see VicRoads’ latest folly! This entry was posted in Uncategorized and tagged Cathcart, Community action, roadside tree loss, roadside vegetation, VicRoads. Bookmark the permalink.